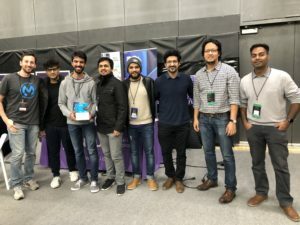 API’s listed for Hack NYU 2019 were used by different teams and the best usage was shown in a web application called Day2Day, developed by Graduate Students from NYU Department of CS who were declared as Winners!! The web application first takes the user details in the registration process. Then we can add the courses ( Courses API) which we want attend and take user input for the class (Class Roster API) timings and day. Then we select a date for which we want our schedule. After we select a date, all the events (Engage API) on that day are listed and we mark the events in red stating that it is overlapping with the schedule of class. We also have a feature of bookmark where a user can save the favorite events for easy access to them. For each event, we have used Google Maps API to show the distance from the current location to the destination where the event is by bus, train and walking and guide the person to the destination. On the map, we have highlighted the unsafe area (data obtained using the Public Safety Incident Data API). After every calendar year(Academic Calendar API), we delete the user profile so that he can create a new profile and add the new courses. !! 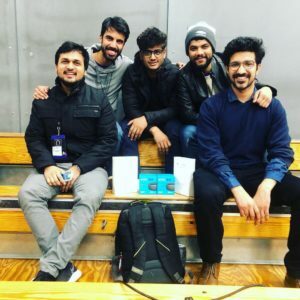 Congratualtions to the winners of API prize sponsored by Mulesoft ! !